That is to say, two strange and interesting trees (I doubt the trees feel all that much curiosity, although we do suffer from something of a language barrier, so who’s to say, really; it’s probably a little presumptuous of us to think we know what they’re feeling). I spotted this first tree the same day I returned to the beetle-hole-turned-sapsucker-well grove over at the 100-acre woods; it was the subject of my pushed-luck photos, the ones I managed to take following the resurrection of my camera battery. I wouldn’t’ve been heartbroken had the battery returned to the dead and I’d been forced to return home without the photos, but I did stop and puzzle over what I was seeing for a few minutes. What caught my eye, initially, was this ridge that seemed to run along the side of the trunk. It was about two inches wide and nearly the same high, sticking out from the trunk proper. It looked an awful lot like the thick trunk of an ancient climbing vine, a Virginia Creeper or grapevine (our Poison Ivy doesn’t climb here). It took close examination to convince me that it wasn’t external to the tree (or previously-external-but-now-being-grown-over). No, it actually appeared to be an old wound, now healed and thick with scar tissue. The fact that the ridge broke and jumped slightly sideways at eye-level confirmed that it wasn’t (or hadn’t been) a vine. Intrigued and still puzzled, I circled the tree and followed the ridge as it rose up the length of the trunk – in a spiral, all the way up to where the branches started, thirty or forty feet from the ground. Any guesses? I believe this is the scar left from a lightning strike many years ago. I wrote a whole post about how lighting works a few years ago (I initially wrote a couple, and then realized it had been longer than that; I’ve been blogging more than three years. Goodness. ), after a tree behind my parents’ house had been hit and destroyed by a strike. Trees are often hit by lightning not just because they’re tall, but also because they’re wet – whether on the outside, from rain, or the inside, from sap – and therefore conduct electricity extremely well. The lightning, once it reaches the tree, takes the path of least resistance. Although this can sometimes be down inside the heart of the tree (as it was for the pine), usually with disastrous results, it can also (perhaps more often) be down the outside of the tree, either through the water that’s soaked the outer bark, or through the sapwood just under the bark. While lightning traveling the outside of the tree will likely do little damage beyond superficial burns, if the electricity enters the tree it can be more problematic. Lightning is incredibly hot, even hotter than the surface of the sun (which means little to most of us, since none of us have been there to experience it firsthand, but does at least give you the understanding that lightning is really, really hot). It should come as no surprise that any liquid that comes in contact with lightning is instantly vapourized. When the lightning travels through the inside of the tree, through the sap, the sap is instantly vapourized, turned into a gas. Gas takes up more space than liquid – it’s all the same atoms, just spaced a whole lot farther apart (yes, you can have solid/frozen oxygen, if you can somehow get the temperature down to −362°F/−219°C) – so you can imagine what effect this has if the liquid had been in a confined space. Yup, that’s right: kaboom. If the lightning travels through the outer sapwood, rather than down through the heart of the tree, the effect is the same, but less pronounced. 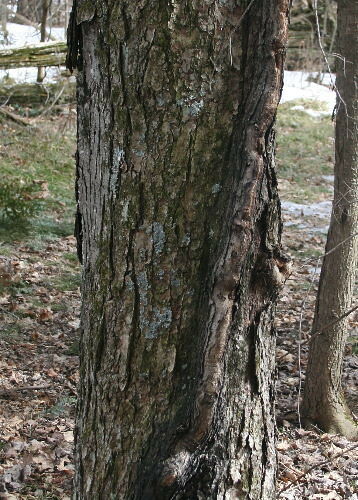 The outer bark and probably the layers of sapwood (the phloem and xylem) will be stripped along the route the lightning takes, but the rest of the tree will remain intact. As the tree heals over the open wound, it will inevitably form a ridge of scar tissue, and that’s what I think I was seeing here. So what I think happened, why I think the lightning traced a spiral route down the tree, is it was simply following the path of the bark. Pretty neat. The tree seems to be doing well these days, despite the incident. This tree I’ve seen a few times. It’s also over at the 100-acre woods, but at the edge of one of the fields. I’ve walked by it a number of times, and when I photographed it a couple of days ago, it wasn’t the first time I’d noticed it. In fact, I think the first time I’d consciously taken note of it was during the winter; this year or last, I can’t remember. I do remember, however, thinking that the branch had been torn in one of our ice storms. Pines seem particularly susceptible to this sort of damage, because they have so many long needles which catch not only ice but snow, and because they’re a softwood, and their limbs aren’t quite as sturdy as, say, a maple or oak. So I’d noticed it before and not thought too much of it, but when I walked by the other day I realized two things: first, the limb was still alive, and second, that it wasn’t even a recent, open wound. Looking more closely (below) it’s obvious that this happened quite some time ago. Not only is there no recent wound, there’s barely any evidence of a wound at all. Like the lightning-struck tree, the damage was minimal; the pine’s limb was still connected by enough tissue that it simply grew over and sealed the wound, and carried on. I love seeing resiliency in nature. 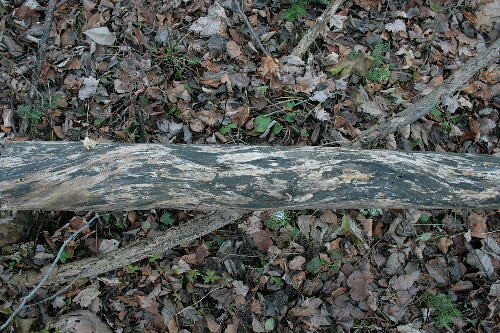 I have seen lightning strikes on a tree trace odd patterns. This appears so vine like a damage perhaps the lighting ran down a vine. Don’t know if that is possible. 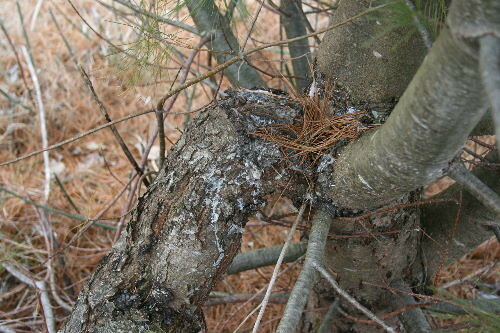 We had a terrible ice storm in 2009 here in Kentucky damaging trees over hundreds of miles. 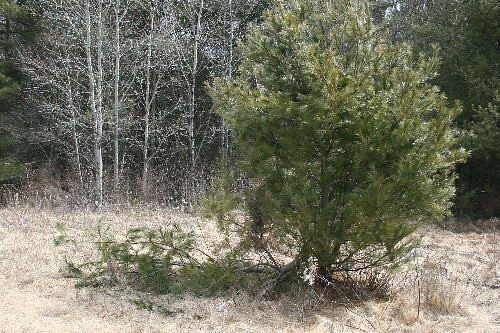 We have two cedar trees that look like this second tree in our pasture. Old cedars that were once bush hogged then grew back like a couple trees together. The ice storm broke down a section but enough connection remained for them to continue growing and healing. It is interesting how the trees have a great deal of sprouts that are replacing broken of branches and tops to retain their balance. LOL. I was thinking the thoughts you opened with as soon as I saw your title. You’d think we were related. Interesting post. Amazing how trees can show you their history if you take the time. I also think that’s a pretty amazing photo—so tall and narrow, it shows the whole trunk and still fits on the page! Glad I’ve finally found soemnthig I agree with! this is so interesting… i have been wondering about lightening strikes on trees so a bit of serendipity here! Interesting – I hadn’t thought before about the mechanics of how a lightning strike damages a tree. Very observant of you to figure all this out. i love this blog. thank you for sharing all of this.